Protect your rights, exercise your options, and get a cracking-good gun in the bargain. The PXT 14.45 is one of two handguns being sold by Para-Ordnance to support the NRA's Institute for Legislative Action. The famous movie quote "Fasten your seat belts; it's going to be a bumpy ride" could well describe our near future. Those in power are not friendly to us. There are already panicked cries of impending bans of one kind or another. "Which gun or guns should I buy before the ban?" is a common question at gun shows and gun clubs. Well, the best defense is a good offense. You should be sending money to gun rights support groups--all of them--and becoming a member. But it doesn't hurt to hedge your bets and stock up on the "likely suspects" either, just in case. Well, there is a way to do both. Para-Ordnance has introduced its Gun Rights pistols. You can have your choice of either a hi-cap or single-stack 1911, and when you buy one, Para will donate $25 to the NRA-ILA. In case you don't know, the ILA is the Institute for Legislative Action. It is the legislative, electoral and political arm--the lobbying wing, if you will--of the National Rifle Association. What you get for your investment is an top-notch pistol. Both Gun Rights models--the PXT P14.45 and the single-stack PXT 1911 SSP--are all-stainless. Each model has the modern-style beavertail grip safety, flat mainspring housing, lightened match trigger and Novak-inspired rear sight with a pair of white-dot inserts. They come with the newest competition must-have, a fiber optic front sight. For those not on the cutting edge of things USPSA/IPSC, a fiber optic front sight has a small plastic bar in it that collects ambient light. The only way for the light to escape is out the ends, so you see a glowing (in this case red) dot in your front sight. If there's any light at all, the bar glows. More light, brighter glow. It is a self-regulating dot that works in bright or dim light. It's way cool, and many of the best competition shooters have it. Best of all, if something happens to the fiber optic, the sight is still there as a standard steel blade. The extractor is the new Para-Ordnance X-tractor, which will pull empty brass harder than the lure of free money. The fit of the slide and barrel is cause for some comment. I have heard shooters who complained that they just didn't like the (to them) "sloppy" fit of the slide and barrel to frame. Some people just aren't satisfied unless what they own locks up like a bank vault. Now, I have a number of "bank vault" pistols. Paras don't lock up that way. If you have strong hands, you can feel some movement when you wrestle the slide on the frame or push the barrel around. I'm more interested in how a handgun shoots than in how it is fitted, and in that regard I've never had a complaint with a Para. While custom gunsmiths might handle it and mutter, I reserve judgment for the range session. A little movement is usually a sign of a reliable pistol, and, again, on the part of Paras I have not had any complaints. Well, there's one. I find after all these years that I don't like full-length guide rods. So, in the event that this one stays here I'll have to change that. But from Para it comes with a full-length guide rod. The author's test gun exhibited excellent accuracy and flawless functioning at the range. While the frame, slide and barrel are stainless, the magazines have the look of a hard-chrome-plated part. Which is good. Carbon steel can be easier to form than stainless, and a chromed carbon-steel magazine can be more durable than a stainless one. Then again, I'm not going to be running either over with my truck, so the difference is probably academic. But the mags have an enviable reputation of reliability, durability and function. Both Guns Rights pistols are in .45, and for those of you already in occupied territory, there are de-fanged 10-shot magazines for the hi-cap frames. Lucky me, I live in a Free State and being the contrarian that I am, decided on the hi-cap version. So I got the PXT P14.45 pistol with a pair of hi-cap magazine, each holding 14 rounds of .45 ACP. The PXT 14.45 is a full-size 1911 with a 14+1 capacity. Para has been at the hi-cap business for 20 years now and finished wringing the bugs out of the hi-cap mags a long time ago. (I was at the first SHOT Show where the company unveiled its new frames.) 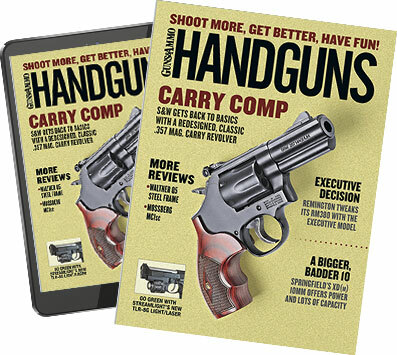 Why, you can even get extensions for your magazines if you wish and make them hold even more rounds. On the outside of the hi-cap are plastic grips, mere hand-fillers outside the frame. Many competition shooters who shoot the Para hi-caps don't even bother with grips; they just shoot the bare frame or the frame with a skin of skateboard tape on it. The single-stacks come with nicely figured wood grips. After I was done inspecting and lusting over the arrived pistol, I loaded the truck with a cross-section of available .45 ACP ammo and went off to the range. I can report the usual boring consistency as to reliable function. Not a single round of the many I launched downrange failed to function. The PXT 1911 SSP is a single-stack Government Model with an eight-round magazine. Both Gun Rights pistols feature Para's X-tractor and fiber optic front sights. The brass was all smartly ejected, landing in the snow drift that builds this time of year on the right side of the range. I'll find them after the thaw and give them their usual chemical cleaning to make them bright again. The magazines never failed to lock the slide open when empty, nor did they fail to drop free of their own weight when I pressed the mag catch. Falling into the snow and mud did not give the magazines pause, nor did the cold. ugh--no problems. The sights were zeroed right out of the box, and the groups were satisfyingly small with all brands of ammo. This group was shot at 25 yards, over sandbags, with the Laser Cast and Vihtavuori load--five shots into less than two inches. The author knows when to quit and take the photo. I had a small batch of the best load I've ever found: 200-grain lead semi-wadcutters from Laser Cast over Vihtavuori 310. My experience has been that every 1911 shoots it best with this load, and if a pistol won't shoot it well, there is no need to keep the gun. After shooting the Viht load, I have to conclude that this is a keeper. Five shots into a tight cluster well under two inches in diameter from the 25-yard line is plenty good enough to earn a spot in my safe. If there is one complaint I have, it would be that Para and the NRA-ILA should have worked out a deal to get the NRA-ILA logo on the gun. That way anyone who sees it would know why you or I have it. The suggested retail price for both Gun Rights models is $1,125. However, Para has a very aggressive pricing program with its distributors, and the goal is to make these pistols very affordable so as much money as possible can be raised for the ILA. While Para can only suggest and not dictate the retail price, it is a good guess that if a consumer shops around, he can probably purchase either pistol for well under $900. So you can have your cake and eat it, too. Protect your rights, and get a good gun at the same time.